The central bank had, in the last one year, pumped trillions of naira in illegally financing the federal government under different guises: from the mass purchase of treasury bills to humongous direct financing of the government through the “window account”. 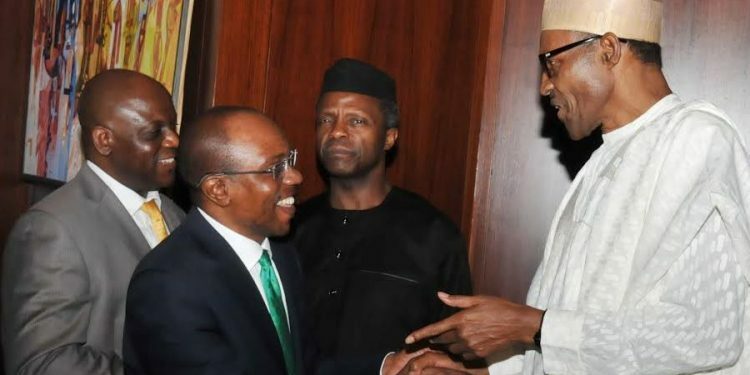 Insiders say the apex bank is “creating money” to “finance a government that is broke and which does not have an economic vision,” in what one of them called a “desperate move by the central bank governor, Godwin Emefiele, to remain in office”. Although Section 38 (1) of the Act empowers the bank to grant “temporary advances to the Federal Government in respect of temporary deficiency of budget revenue” subsection 2 of the same section stipulates, “the amount of such advances outstanding shall not at any time exceed five percent of the previous year’s actual revenue of the Federal Government”. The conduct of the government and the CBN, according to the economist, may, by limiting the organized private sector’s access to credit, have contributed to the dire straits in which the sector currently finds itself. “We thus find ourselves at a point where government borrowing from the CBN is neutralized by raising the CRR of banks, thereby limiting private-sector access to credit,” he said. Sounding perplexed and perhaps frustrated, Mr. Salami said, “Whilst I still wonder what the underlying economics is – I sincerely hope it works!”. “To prevent the effect of continuous and massive injections of cash to fund the Federal Government showing up in sharply higher inflation and currency weakness, the Central Bank now applies “special auctions,” Mr. Salami said. Apart from raising the CRR beyond the 22.5 percent approved rate, Mr. Salami said, “the format of these “auctions” recall the dark days of “stabilization securities”. “CBN governor is a banker and adviser to the government,” he said. “The bank is a monetary authority, not financial authority. Their role does not mean reckless lending to the government,” he said. Apart from the huge advances, it is illegally taking from the CBN, the federal government has also been ramping up a raft of local and foreign loans. Another MPC member, Suleiman Barau, also sounded a note of warning on the implications of the payment of N760 billion as Paris Club refunds to states. This reporter’s efforts to reach CBN’s acting director of corporate communication, Isaac Okoroafor, for comments. on Sunday, were unsuccessful. He also did not answer or return calls Monday morning. He, however, sent a text message requesting an SMS inquiry. But as at the time of publishing this story, Mr. Okoroafor is yet to respond to the text message inquiry sent to him.